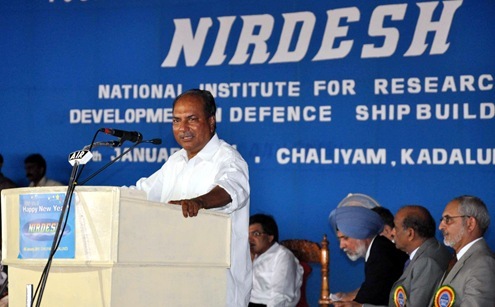 On January 04, 2011 the Indian Defence Minister Shri AK Antony laid the foundation stone of the National Institute for Research and Development in Defence Shipbuilding (NIRDESH). the first institute in India in the field of Research & Development to enhance self reliance in defence production capabilities of Indian Defence Shipyards catering to the Indian Navy and the Indian Coast Guard. to focus on design and development of warships including submarines and other related platforms. located at Chaliyam, Kadalundi Beypore, Kozhikode District of Kerala. to be funded by the Ministry of Defence and all the Indian Defence Shipyards (Mazagon Dock Limited, Garden Reach Shipbuilders & Engineers Limited, Goa Shipyard Limited, Hindustan Shipyard Limited. Here is Press Information Bureau’s photograph of the Defence Minister, Shri A. K. Antony addressing the gathering after laying the foundation stone of NIRDESH.